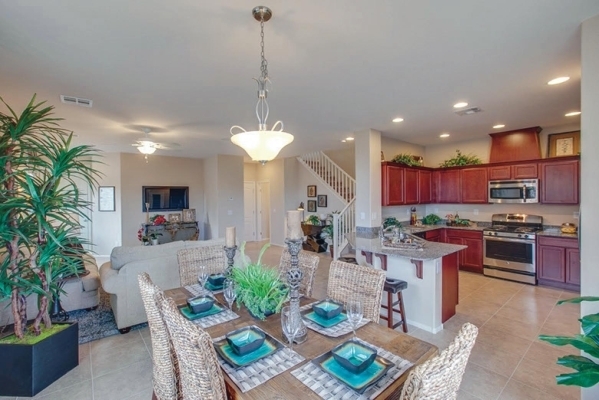 Summit Homes has announced the grand opening today of Hazelwood, its newest community in Silverado Ranch. The community is a collection of three two-story designs from 1,907 to 2,043 square feet. “There has already been keen interest in Hazelwood for a number of very good reasons,” said Nathan White, Nevada Division manager of Summit Homes. “Among them is this is the only new-home development in the Silverado Ranch area, so buyers can enjoy the latest design and features of a brand-new home and still live in an area that’s already well-established. Virtually every neighborhood convenience is already nearby including shopping, restaurants, schools, entertainment, medical and many other services. Located off Maryland Parkway and Silverado Ranch Road, Hazelwood is a boutique community that will consist of 22 homes. The three two-story homes available start with Plan 1937, which features a ground-level main living area of a great room, dining area and a kitchen that includes many cabinets and standard granite countertops. A loft is found at the top of the stairs that separates the two secondary bedrooms and the laundry room area from a master suite placed at the rear of the home. Plan 1944 expands the living space on both levels, adding high volume at the foyer. One enters into a roomy and light-filled great room with an adjacent dining room and kitchen. The kitchen showcases a large, floating island. The upstairs loft is placed between the master and bedrooms three secondary bedrooms, while the laundry room is on the lower level of this floor plan. Wrapping up the trio is Hazelwood’s Plan 2043. At 2,043 square feet, it is an extended version of Plan 1944 that enlarges the master suite and ground-floor living spaces, allowing for full advantage of the varying lot sizes within the community. An interest list has been forming over the past several weeks during construction of the model homes. Currently offering homes in five communities throughout the valley, Summit also offers several financing programs and buyer incentives in select locations, and homes available for quick move-in. To visit Hazelwood, take Maryland Parkway south past Silverado Ranch Boulevard, turn right on Gary Avenue and follow the signs. Call 702-937-0513 for more information, or visit www.SummitHomesNV.com to learn more.